Many of our customers come to us with very specific requirements not only for the display of their content, but also for customer databases, enquiry forms etc. In these case, the best solution is to develop a CMS from the ground up, using either Java or PHP. Here we display some examples of custom CMS development. 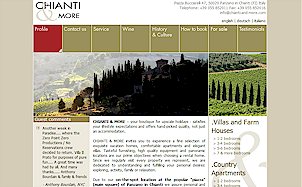 www.chiantiandmore.com incorporates a complex display of properties for rent, searchable according to admin-defined criteria. This means that all of the details of the rentals are indexed. Images are managed via a custom built image manager. In addition to the property display, which is multilingual, the CMS has its own customer database where email exchanges are archived. Of course, there are also several pages of free-form content which is added via an html editor. This site has achieved extremely good rank in the search engine result pages as a result of the fresh and original content of the site and the high quality links provided by ammonet. 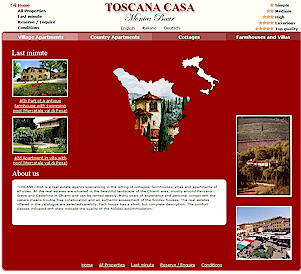 www.toscana-casa.com Toscana Casa and its sister site Ischia Casa have a complete property management system, including image and customer management, and are in three languages. File name, title tag and matatag generation is semi-automatic and optimised for search engines.